Ex-pat New Zealander Gabrielle ‘Ellie’ Conway is an FBI special agent with a passion for poetry. In fact, she is part of an Internet poetry chat room called Cobwebs. Conway’s life turns upside down one night when chat room member Carter McClaren shows up at her house to ‘pay her back’ for having been banned from the room. McClaren’s arrested but shortly after he makes bail he disappears and his body is later found in the trunk of Conway’s car. With the body is a Post-It note with a poem written on it. Conway and Connelly also receive emails from the killer. Soon other bodies turn up. Each body is found with a poem and before each murder Conway and Connelly get emails taunting them. It’s soon clear that someone is targeting the members of the poetry chat room, but this case is not as simple as a crazed serial killer who doesn’t like poetry. It’s soon clear that the killer has taken a special interest in Conway and knows her personally. Conway doesn’t want to put herself or anyone she knows at risk so she and Connelly go into hiding and try to use the chat room to track down the killer. Catching the murderer turns out to be very difficult. For one thing, each crime scene is ‘clean,’ meaning that the killer leaves no real evidence. For another, the killer seems to be able to track Conway and Connelly, no matter where they are. Finally, a casual comment starts putting the two on the right track and in the end they find out what really connects these murders. This is a thriller, so the pace is fast, there’s plenty of action and there’s a strong sense of suspense. Every time Conway and Connelly begin to feel a little safe, something happens that shows them that they’re vulnerable. So this is as much a psychological battle of wits as it is anything else. Connor is to be commended too for evoking very effectively the sense of fear that comes from being stalked. There’s plenty of violence in this novel and readers who dislike gore will want to know that Conway and Connelly deal with their share of it. But although I usually don’t care for gore in novels, one thing made it less of a problem here: effective black humour. Throughout the novel both Conway and Connelly deal with the reality they’re facing through ‘gallows humour.’ Readers who enjoy those sorts of comic moments and lines will appreciate that element of this story. Because this is an FBI/police novel, we go ‘behind the scenes’ as the various agencies try to catch this killer. There’s a realistic picture of the process of getting evidence, making use of forensics information and setting up FBI operations. It’s interesting too to see how the FBI manages undercover work and hiding agents. A big part of the FBI’s modern arsenal is technology, and since these murders seem to be connected through a chat room, we get a good look at modern electronic communication. Connor also gives readers an authentic picture of the FBI’s electronic monitoring. The killer seems to be at least as adept with technology as the FBI is so there’s a fascinating ‘cat and mouse’ game as each side tries to outwit the other. 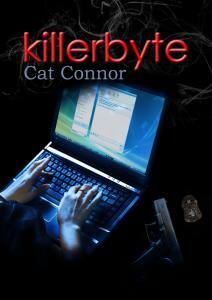 For me what sets Killerbyte apart from other techno-thrillers is the characters. As the story unfolds we learn that Conway and Connelly have strengths and all-too-human weaknesses. They both have family issues in their backgrounds but are trying not to be defined by them. They depend on each other and each of them has a very believable reaction to being stalked and targeted and to the deaths of people they know. Beneath the humour Connor reminds us that these are very real people who are dealing with some very scary situations. The other characters are well-drawn too and Connor makes it easy to care about them. Killerbyte is a fast-paced techno-thriller with welcome black humour, a likeable pair of protagonists with some real depths, and a mystery full of twists and turns. Readers may want to peek through their fingers now and again, but it’ll be worth it. Margot Kinberg is a mystery novelist, crime fiction commentator, and Associate Professor in California. You can read more about Margot, and check out her excellent blog, Confessions of a Mystery Novelist, here. Sounds like a good book. I like the use of modern technology/chat rooms in the plot. I'll look out for the book. Sounds like a fast-paced read! Thanks for sharing the review, Margot. Sarah - Ooh, that's one of the things I really liked about this novel too. It features today's online environment. It's interesting too to see how that environment becomes such a part of peoples' lives. Elizabeth - It does have a nice fast pace. I think what I like about the pace is that it's a solid blend of action and character development. Not easy to do.